Catherine DeBonis is seated on the left. 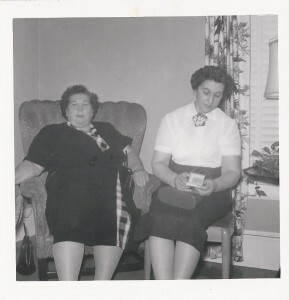 I am unsure of who is seated on the right or when and where this photograph may have been taken. Any information would be greatly appreciated. This entry was posted in Family Photographs, The DeBonis Family and tagged Catherine DeBonis, DeBonis family history. Bookmark the permalink. This was your mother’s bridal shower. That is Sadie King, Nana’s best friend who married one of Nana’s cousins and became a King!